I realized recently that not only did I not have a stash of spinning fibers, but I had absolutely no fibers dyed by other people. What a shame! I’d see fibers, then think “Ah, I can do that, so I shouldn’t spend the money.” Well, sometimes you just need a treat. Amy and I decided to trade subscriptions to each other’s fiber clubs, so that’s one fiber per month added to my stash. My first month receiving fiber from Amy was May and I finally got to spin it the night before last. This is a nice, soft single, as balanced as a single can be: not a hint of a twist to the skein when hung. Here’s some great info on spinning low-twist singles if you’re new to that. Then I saw batts over at Spritely Goods and needed some of those. Can you blame me? 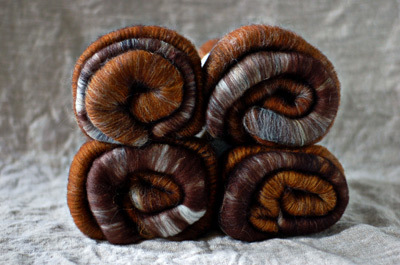 I started on these last night, spinning one batt into singles as is and splitting another into layers, one dark brown and white, the other brown, and then splitting the layers in two for the other single. I’ll spin the second bobbin in 4 big fat stripes and ply it with the first bobbin. Hopefully, this will result in long, subtle stripes in the finished 2-ply. Will report back on that! Since I never did post a photo of the Hello Yarn Fiber Club June offering, it’s about time. This stuff is crazy soft! I hope everyone likes it. From now on, Iâ€™ll keep the dyes I mix up for the club fibers for a month or so, so that you may order more of a colorway if you like. Email to order and include your full name so I know who you are. This is only for club members. Oh, beautiful stuff, all of it! 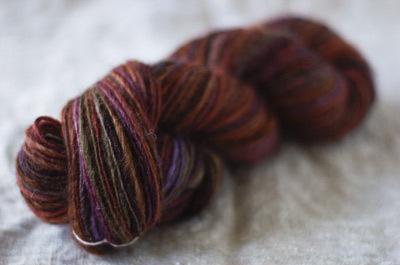 Every time I see that Nightshade colorway, I feel all dreamy And the Spritely batts look like s’mores. Or snails. You are real bad. Now I’ve gone and ordered some batts in a wonderful green at Spritely Goods! I’m looking forward to your fiber club. I hope I’ll get in as soon as it will be open again. Your Nightshade singles are faaaaaaabulous! :-) I haven’t spun mine yet, but I’m thinking that singles may be the way to go. That’s a good idea – swapping clubs. Beautiful roving. It’s all drool worthy. i am so knicking myself for not joining your club when I had the chance! I’m totally getting in on the next round! 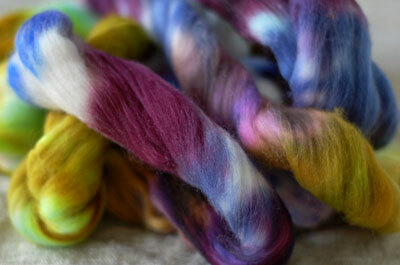 the batts from Spritely Goods are divine!! but you are so good at doing the right thing with them! June’s colorway is GORGEOUS! I’ve spun about half of it (even with predrafting the heck out of it, I’m having a hard time spinning consistently) and I’ve been wondering if those little bursts of color (like the pink) are intentional or just happy accidents? I can’t wait to see the finished yarn from the Spritely Goods Batts…they look heavenly as fiber and I’m sure they’ll be dazzling as yarn.